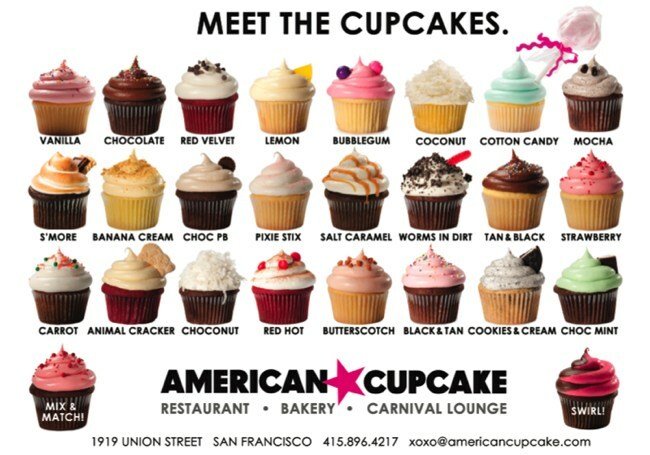 Order any of our cupcakes & confections for pick-up or delivery within SF! Order online! See Cupcakes Available Today! Themed toppings, edible images or special decor? Contact us! Our flavors change weekly! Certain flavors sell out quickly. To guarantee flavor availability, place your order at least 48 hours in advance of your pick-up or delivery time. is more than just cupcakes! We make snoballs, whoopie pies, cake pops, cotton candy and more! We’re happy to customize colors, fillings, and ribbons. We offer cakes in a variety of shapes and sizes, including traditional layer cakes, pull-aparts & the giant cupcake cake. See our cake guide! No pick-ups on Mondays – we’re closed! No deliveries on Mondays – we’re closed! Items from our Party Menus can be ordered to-go! Contact us to discuss.